In a couple of past posts I have noted the difficulty I have had in getting turnsole plants to germinate. These are the fascinating plants that produced the medieval illumination color (or rather colors) of folium, and for which I have named my blog, my adventure, and, if it ever comes into being, my company. The plants: I have planted, I have fed and watered, I have cried and cursed – and no matter what I did I could never get more than one out of many to sprout. Once they do sprout, they also need a lot of sun to grow, which is, or has been for the past two years here, a major consideration. But that issue pales with just getting them to put in an appearance in the first place. Having said that, I figured out what else turnsole seeds need in order to germinate. They need a year. 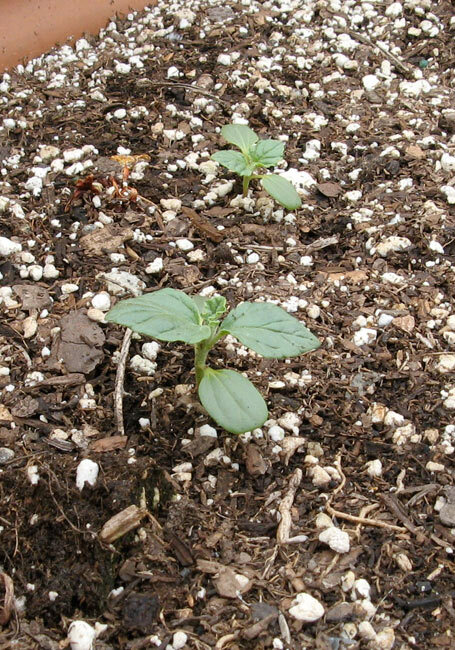 Late in the spring of last year I planted many of my turnsole seeds in degradable seedling trays, to see only one of them come out of the ground. That one languished and ultimately failed because of the lack of sun last year – but none of the others came up at all. Eventually I stopped watering the little trays, disgusted, and let them sit. I figured I was going to have to order more seeds. Disappointing. Then, earlier this spring, it was time to plant the tomatoes. 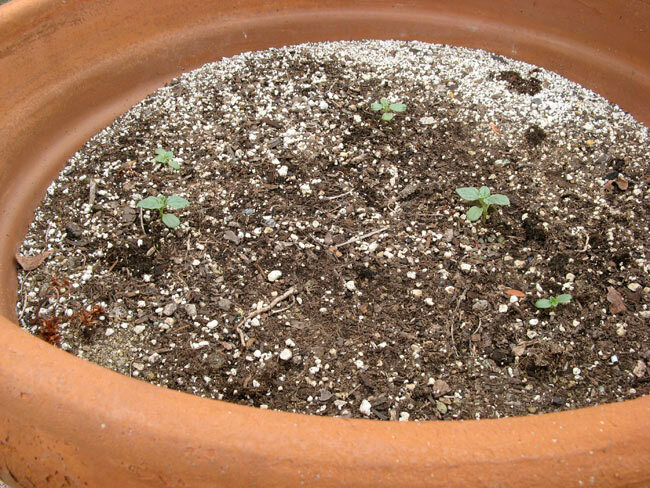 Rather than waste the soil that was in the trays, I smashed them up and mixed them into the soil in the larger pot before planting the tomato seeds. Lo and behold, a week or two later turnsole seedlings began coming up. Well, they looked like turnsole seedlings, but I wasn’t completely sure at first, so I didn’t post about it. Now I’m sure. It’s them. They waited an entire year to make their grand entrance. Patient little buggers, them. I plan to ask my source of the seeds, over in Malta, if he knows anything about these plants requiring a year to germinate as a general thing. But I’m guessing that’s exactly the case. Consider: before, I had extreme difficulty getting even one or two of them to sprout; now, suddenly, five of them have enthusiastically volunteered. So: turnsole growers take note. These five are now in a similar fix to the loner from last year: struggling under a lack of sunlight. But they’ve gotten an earlier start on the growing season, and I bet the gloomy weather won’t be quite as bad this year (though it certainly is so far!). So I’m hoping to have a nice little crop of sunsikell plants again this year. The ironic part? None of the tomatoes came up. Not one. I spent the morning in the garden today – some of you are waiting for fresh iris rhizomes, and the weather finally cleared up enough for me to go dig some up. However, as has happened on so many other occasions, the best of intentions were thwarted – by the madder plants. I wanted to replant some of the rhizomes that have been sitting around here for too long, but to do that I needed to make sure the madder roots would leave the poor little girls alone. Turned into a pitched battle, as usual. But! I cleared a space for the irises, got some of them into the ground, and I will dig up some fresh bulbs on Thursday morning, to be sent Friday or Saturday. Speaking of madder: I’ve enjoyed a bit of a milestone this spring, as for the first time I’ve made a madder lake from the roots I’ve grown in my own garden. All looked well, and for a while I was pretty excited. 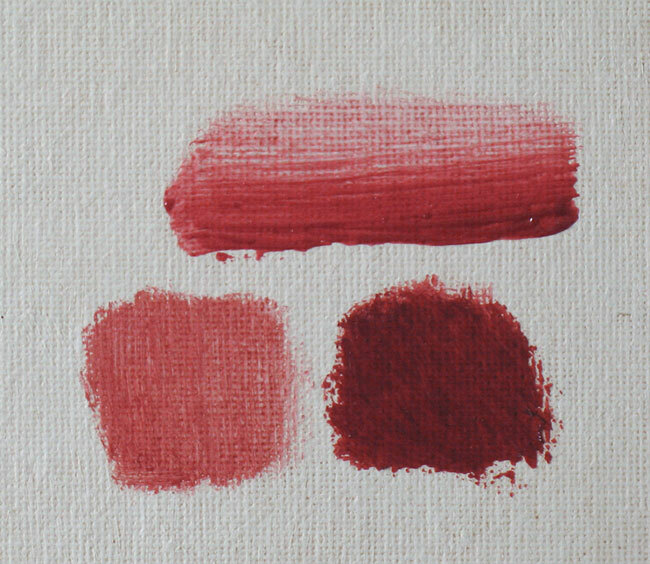 But when I mulled a bit of my new lake pigment up into an oil paint today after I returned from the garden, I found that the color is not as good as I had hoped. It’s darker and less saturated – almost maroon – and not nearly as bright as the madder lake I’d made from store-bought madder roots. 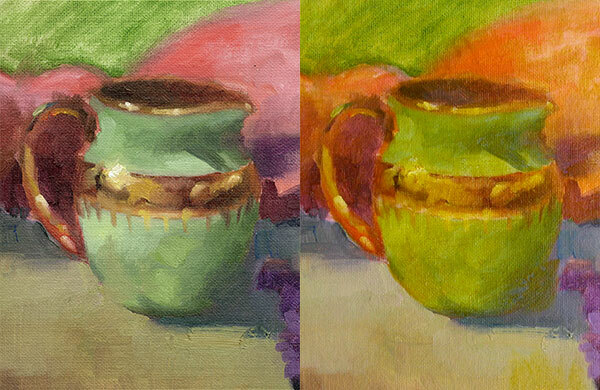 Only when I apply the paint as a very thick glaze does it approach a decent red color. This is not at all good enough to justify all this trouble. Trouble! If you’ve never grown madder, then you can’t really understand what a royal pain the stuff has been. For evidence, just take a look at the board I happened to pull up today while digging for the roots. Yes, those are fresh madder roots pushing their way right through the board that I had put down there to stop them. Also, even after you’ve fought the plants for years, and dug deep to get the roots out, it’s still a painstaking process after that to get a decent lake pigment from them. (At some point I’ll share my madder lake recipe, but not yet. There are still too many variations to try out before I’m sure of myself; and I’m still not sure if the recipe belongs here on this blog, or in a book. Or whether or not I’ll write a book at all.) So, if I can’t manage a better color than this, I’ll just go through the garden over a weekend and just rip them all out. Give the irises some more room. To the right you can see two swatches of the madder lake from my garden, the two swatches at bottom. For comparison, I brushed out my previous madder lake, made from commercially-bought madder roots, above them. It’s not a really accurate pic, but you can see the difference. The lake from the garden isn’t horrible or anything – just not worth all the trouble. I can think of three reasons why this color was not as good as the other I made. One, I made it a bit differently. (I don’t think that’s the reason.) Two, the earth in which the madder is growing may not be alkaline enough. 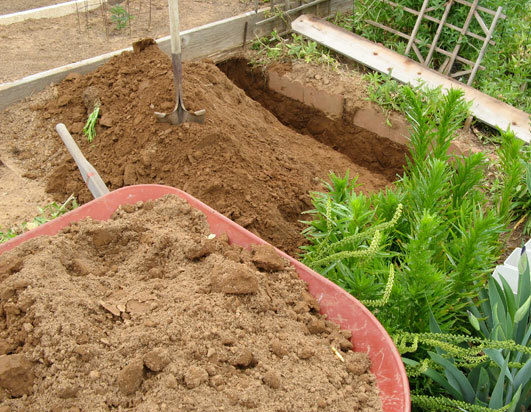 (I doubt this is the reason either; the soil around here is pretty alkaline. But it’s possible.) Third, the roots from which I made this lake were too immature. This was a mixed batch of roots that were dug up at one and a half years and two years. I’m guessing – hoping – that’s the reason. Today I dug up some roots that are clearly mature. They’ve been in the ground for about three years now. And just take a look at the size of some of those honking madder roots! I’ll be trying these out to see if there’s a substantial difference from the last batch, using exactly the recipe I used with the commercially-bought roots. Hopefully these will make something a lot closer to that one. If not, I’ll try amending the garden soil with lime or something. And if that doesn’t work, I may rip the things out and grow something easier instead. It would be disappointing – but kind of a relief too. I’ll report as I learn. 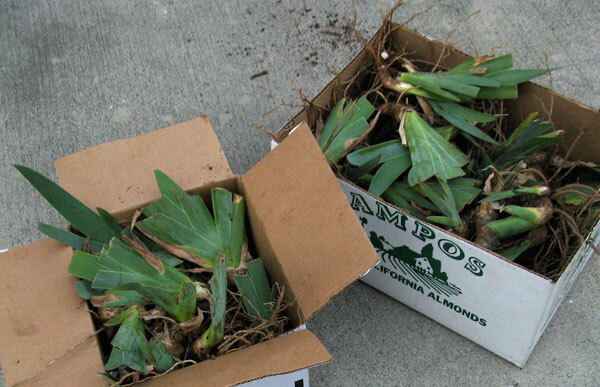 Next week, I’ll be taking my blue iris rhizomes out of the ground, about two months late. (Okay, more like three months. Whatever…) These are the irises I’ve used to create the iris green ink, which you can read about here, here, here and here. I don’t know exactly how many I’ve got, but it must be several dozen at least. I only need a dozen to replant, maybe a dozen and a half. So some rhizomes will be available for sale. I don’t know exactly how much I’ll charge, but it won’t be much over what it costs me to box and ship. Not interested in a profit here; just want these little girls to go to a good home! This is an heirloom variety, and even if you’re not interested in making iris green ink, the blooms would be quite beautiful in any garden. If anyone is interested, let me know in a comment to this post, or drop me a line. I’ve harvested some weld plants from my other garden plot. This is a plot I’ve given up this spring as I just don’t have time for it this year. The wedding is coming up fast and there has been no time to do so much as order seeds. (Well, okay, I’m sure I could have found a little time to do that – but things do have a way of piling up and slipping by me.) I’ve posted some pics of young weld in the garden – here is a shot of some of the weld plants hanging to dry in the garage. 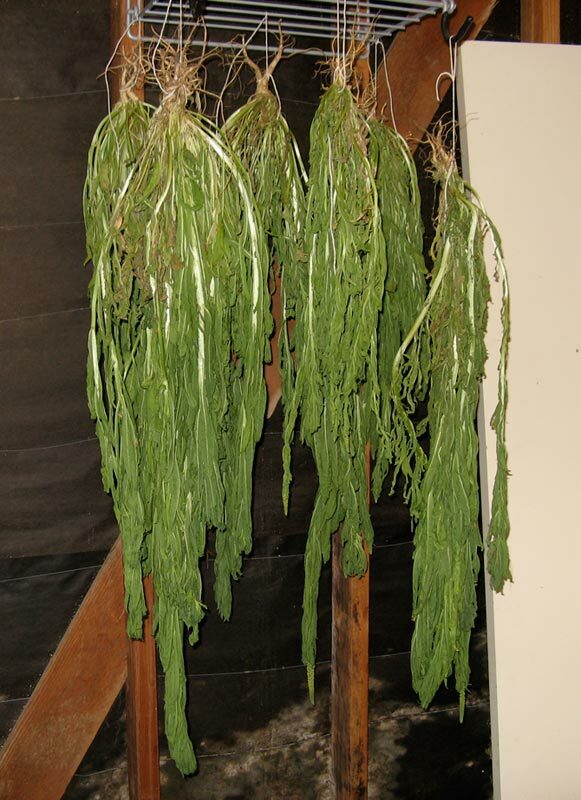 I’ve read they should be dried like herbs: hung upside down so the good stuff stays in the leaves, so that’s the way I’ve always done it – although when I extract the dye I’ll be using the whole plant except for the roots. This drying process should really be done when the weather is warm and dry, and we’ve gotten some unexpected late El Niño rain… but these should still be okay. They should have some good strong yellow dye in there for making my yellow lake. Also, in the main garden plot: the bearded irises are finally flowering, and spectacularly. These are an heirloom variety of rhizome I bought from a cooperative grower in Oklahoma about a year and a half ago, and I’ve been nursing them along ever since. They are blooming now at last, and the flowers are incredibly beautiful, an iridescent blue-violet. This is the first one to bloom, and I gave it to my lovely fiancée; there are more irises blooming now. Behind the iris plants are a couple of weld stalks. 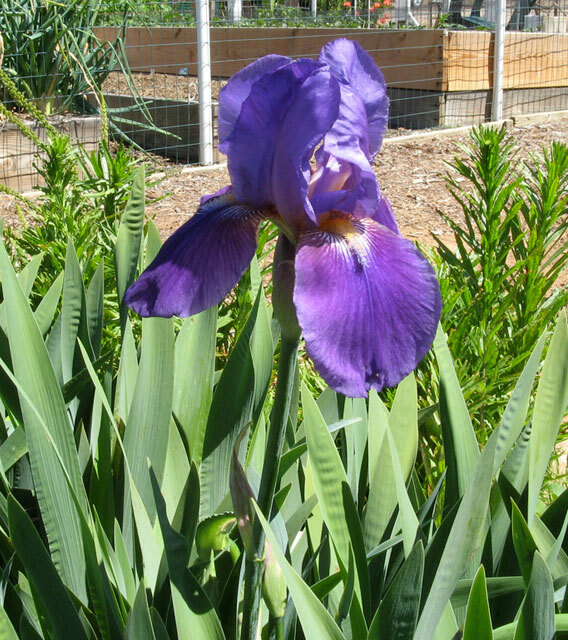 Why are these iris plants in the dye garden? Well, I tell people they’re to make things prettier around there, since so much of what I grow is rather, well, weedy-looking. But I can get a special color from these as well. During the Middle Ages a remarkable green ink was used in manuscripts, called iris green. It’s visually similar to the sap green derived from buckthorn berries, and at times has even carried that name itself. I made a little iris green last year, from some store-bought blue iris flowers. It’s amazing to get such a pretty green from such a pretty blue flower! Finally, to the right is the hole I dug today to bury a board – to try to keep the madder roots from invading that part of the garden again. My neighbor (a businessman) has been watching my progress with the dye plants and lately has been getting somewhat excited at the commercial possibilities of this “high-end” product. That all ended today when he saw how much labor I was having to put into this. I agree with his newer, less optimistic assessment – you really have to be fanatic about this stuff to even attempt it seriously. 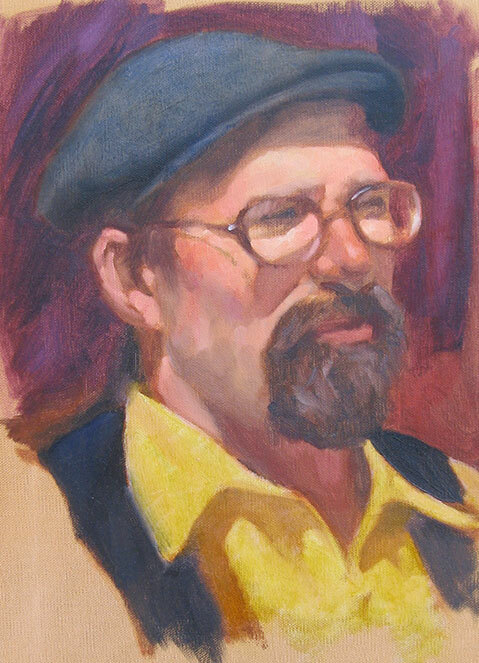 There’s a reason why alizarin crimson kicked natural madder out of the market. I may (probably will) sell a few tubes of homemade paint later on, but basically I’m doing this because I love it. I’m glad my neighbor has lost interest – when I begin selling I want to do it on my terms, and without a profit requirement. Just a natural extension of what I’m doing already. 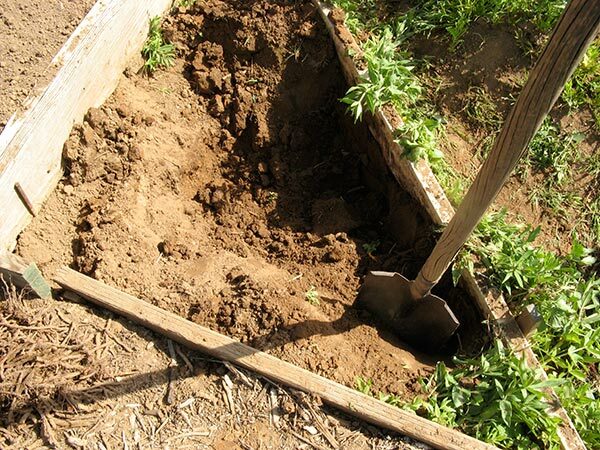 For the past week or two, as I’ve had time, I’ve been cleaning out my garden plot – or trying to. Mostly this has consisted of digging for madder roots. I know I did this a couple of months ago, as described in my post My first madder harvest. But… the stuff grows back. With a vengeance. 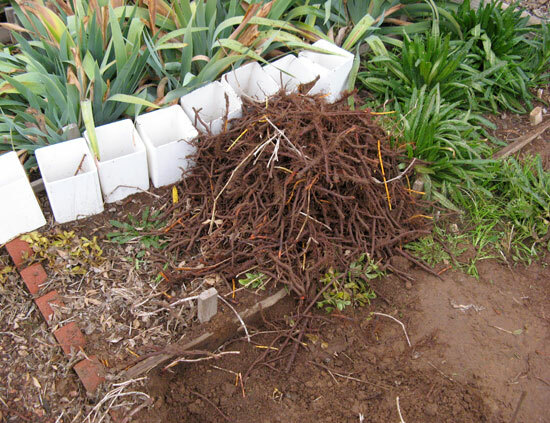 Every little root scrap and fragment I left in the ground seemed like it was springing back to life again, so I needed to get back in there and dig up the dregs before it could get away from me again. The truth wound up being a bit different. It wasn’t just dregs in the ground; I had actually missed quite a bit of the bulky roots by simply not digging deep enough the first time around. The roots went very deep, and I mean the big ones along with the speedy orange runners. Which was good along with the bad: I got some more high-quality roots that certainly have some good dye in them. But it’s been some solid labor to unearth them all, and I’m not finished yet. In the pic above, I’m just getting started with the hole; and you can see the growing pile of madder roots in the lower left corner. This is after cleaning out another, similar area to the left of the pic. Remember how the madder plants had died back in the winter? In case not, here is the pic I posted back in January of one of the plants in its little raised bed – compared with one of the madder beds two and half months later, at the end of March. They are going quite crazy without any help from me. 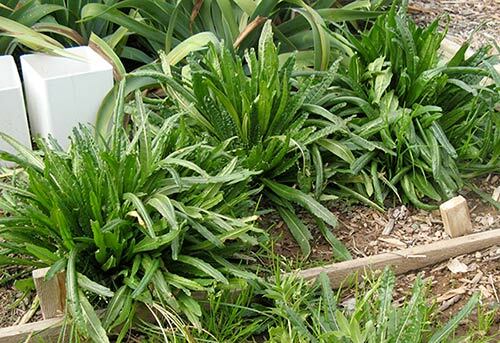 Let me reiterate from my previous post, perhaps more strongly: these plants are aggressive, and quite difficult to contain. 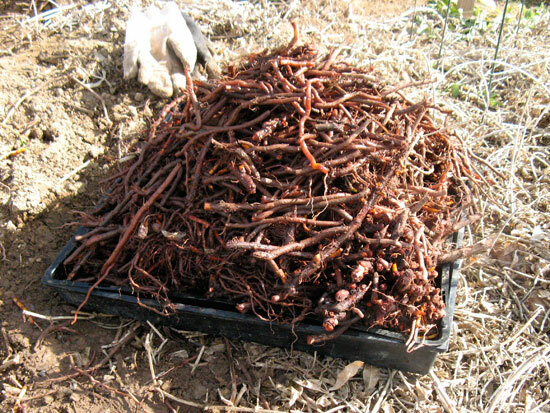 If you plan on growing madder yourself, do put it into containers (or very raised beds), or it will get out of control. 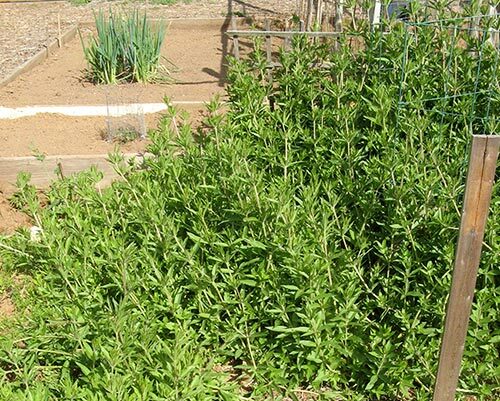 In a way, beginning with too many madder plants has defined my entire garden experience ever since – and will continue to do so until most of these are harvested and completely cleaned out of the ground. 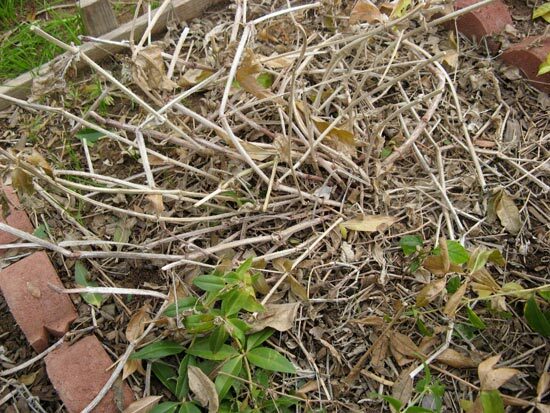 After this continuing fiasco, I’m certain I will never grow another madder plant that is not in a container. If it weren’t for the happy fact that birds are completely uninterested in the berries, making it extremely unlikely that the plants will spread without my knowledge, I would rip them all out now and be done. I won’t be responsible for an invasive species getting loose in my area. But for now they’re okay – just taking up a lot of my time. The pic below: Overrun by madder plants (horror monster music here)! On a positive note, I collected a large number of seed pods from last year’s indigo plants. (And we got a nice fava bean harvest from the other plot!) I’ll be starting some indigo seedlings soon – a little late, but then that’s how I do many things. Especially this year. Wedding is in three weeks! Weld is a color I’ve been grinding into a gouache watercolor for some time now, and it’s a great color. I’ll talk more about weld gouache later, and the process of making a lake pigment. This oil paint that I made from the lake more recently is actually my first handmade oil paint, and also my first paint that I’ve tubed (a process on which I’ll also post). It’s intended as a glazing color, something nice and transparent to layer over a dried paint layer of modeled forms underneath. This is the way it was commonly used in the past (though Rembrandt liked to mix his lake pigments directly in with his other colors). I ground about equal amounts of oil and lake pigment, for a few reasons: that’s about the proportion of gum arabic to pigment in the gouache; that’s what I had read is required for madder lake; and it seemed during grinding to be necessary. As it turns out, it was definitely too much binder. Thanks to a couple of suggestions from the good folks over at the AMIEN forum, I stored the tube upright (cap up) for a few days, and was then able to pour off the extra oil, which had separated from the paint. Last week I harvested my first madder plants, which have died back, as they do, for the winter. The fact that these plants die back in colder weather has been quite a relief for me, since I’ve spent quite a lot of time fighting them this year. I love the fact that I’m growing madder plants for use, and that I’ve just harvested my first bunch of them. It’s exciting. But grower beware: madder does spread aggressively. I planted sixteen madder plants in raised/lowered beds in the spring of last year, taking up about half the garden plot. Yeah, maybe I overdid it a little – but that was right at the beginning of everything, and I was so anxious to get things started, and I didn’t have any other dye plants handy at the time. I also had read that madder needs at least two or three years in the ground before harvesting, and again that made me want to start big. Since then, my main task in that garden plot – at times my overwhelming task – has been to keep that madder under control. They didn’t do much the first year, just kind of lay around in their beds, but the second year they just went crazy. There were two plants in particular, planted in higher, softer earth, which have caused some major issues, aggressively sending runners and shoots into my poor neighbor Frank’s garden plot. He has been good-natured enough about it, but it must have been a bit (or more than a bit) annoying at times to have unwanted madder plants among the broccoli. 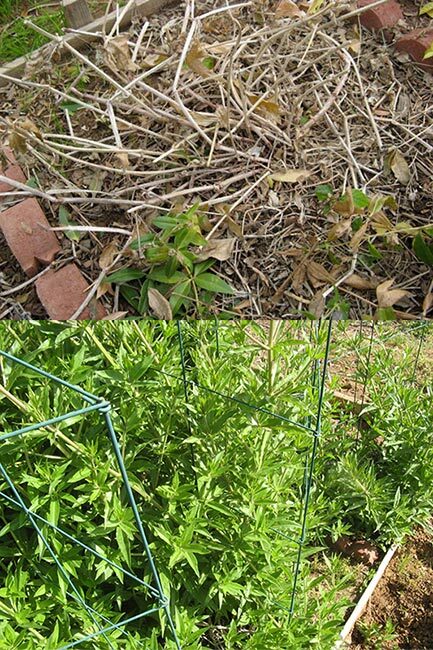 (The pic to the right shows some fresh madder shoots, sent by runner roots, invading my poor neighbor’s garden plot. This is after at least two throrough eradications already this year.) So those were the two plants I chose to dig up first. It’s only been a year and a half, but in this case a year and a half does at least mean two full growing seasons – and I just don’t want to leave those two particular plants in the ground any longer. In any case, I have an opportunity to test the literature on the subject of growing time: since I’ve got so many madder plants in the garden plot (there are still fourteen left), what I’ll do is dig up a new plant or two every six months or so and compare the results. There may be a “sweet spot” in terms of time in the ground versus the amount/quality of dye produced, and if there is I’ll find out. 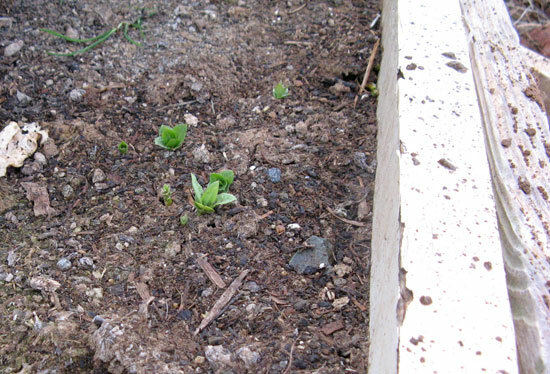 Here is one corner of the decimated bed – that place was absolutely filled with roots. I know I left some roots in there, there’s no way I got them all – but after a while the back wins out over the heart, and there must be an end. I was out there for hours, and still didn’t finish the whole job in a day. Next to the bed, and nestled between some weld plants (right) and blue irises (top) are some of the madder roots after digging. I tried to pass over those much smaller than a pencil, as I know the roots will contract in size as they dry, and the smaller roots probably don’t have a whole lot of dye in them in any case. There were a couple of nice big blocks of root there, even from plants so young. I’ve read in a couple of sources that there is no indication in the appearance of the roots of the color that lies within. I say nonsense. They are bright orange if you break them open. 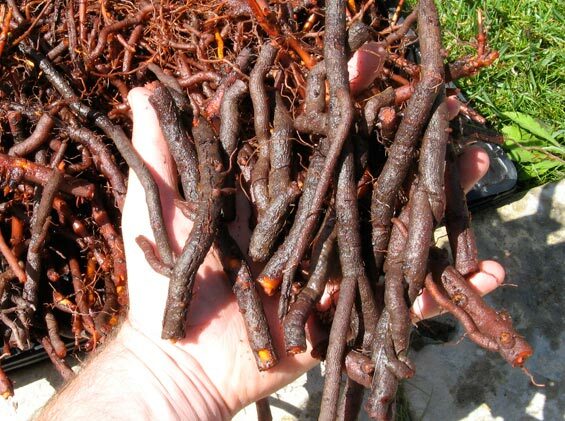 As someone who is obsessed with getting color out of plants, and with trying out new natural dye sources, I can say that trying these roots out for dye content was probably pretty obvious in early times – there’s a reason madder is one of the earliest dyes recorded. 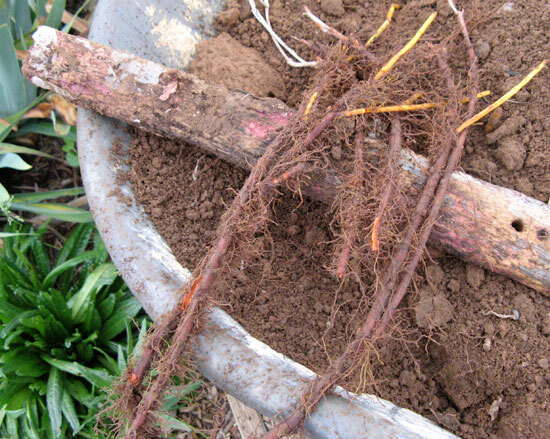 On the right are some pulled roots that have stained the neighboring wood of the raised bed violet with their alizarin! 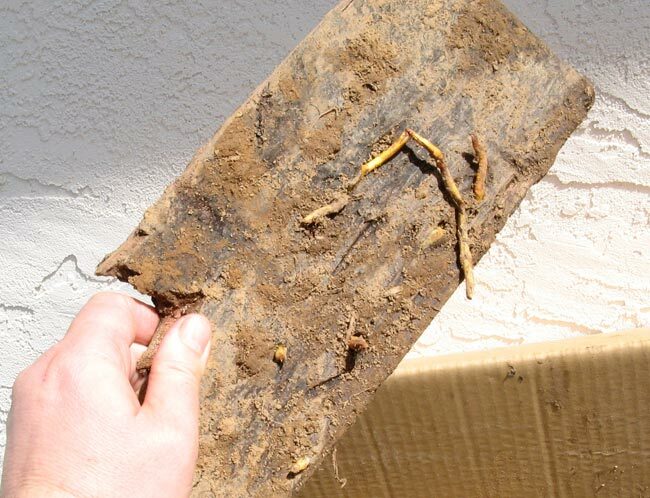 Here are the roots after an initial rinse with the hose, drying out in the sun. Watch out, bees seem to enjoy the smell of these fresh roots; I was forced to defend my harvest! Now the roots are dessicating on the back porch. When they are completely dry I will discard the roots that have shrunk to a very small size, and then test the remainder for dye content. 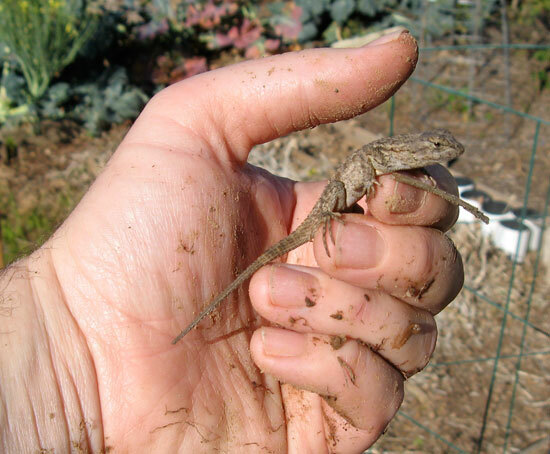 Bonus: I caught a lizard! Second time this year, I guess I’m not as slowed-down as I thought. Or maybe all this gardening is just good for me. Isn’t he cute?